Growing tall in the heart of Melbourne’s CBD, West Side Place is currently on schedule to become the city’s latest residential icon and first Ritz-Carlton Hotel – all while providing future residents with an enviable lifestyle and a dynamic place to live. Once complete, the hotel will be the tallest in Australia, rising 270 metres. It will form the highest part of Stage 1 of the development which will comprise 1376 apartments and 257 luxury hotel suites across two towers, a business centre, a 550-seat grand ballroom, and a check-in desk that boasts panoramic sky views from level 80. Its home on the corner of Spencer and Lonsdale Streets is one of the most desirable in Melbourne, within walking distance from Southern Cross Station and the Southbank arts precincts, and offering views over Docklands, the bay and the cityscape. International developer Far East Consortium (FEC) won the right to purchase the site in 2017 for the $2.6 billion mixed-use development. With the Ritz-Carlton Hotel in Stage 1 and a Dorsett Hotel and a further 1519 apartments in Stage 2 FEC are set to deliver the largest residential development in Victoria. Architectural firm Cottee Parker was awarded the opportunity to contribute their architectural design vision to the project. This project reinforces their already impressive nation-wide expansion. Director and manager of Cottee Parker’s Victorian office, Shane Williams, says their team is proudest of the amenity that the design will give back to the city and its residents. 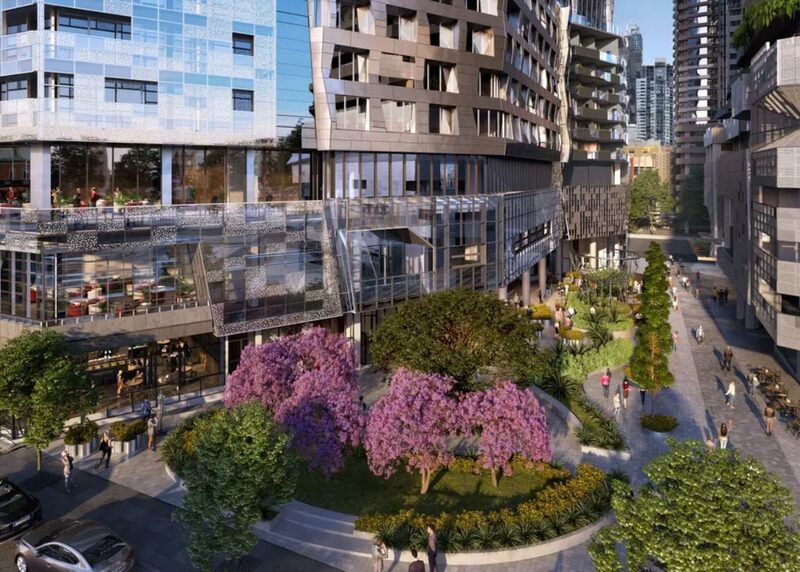 “We hope that the design of West Side Place as a destination precinct will foster a sought-after lifestyle and promote the project as a place that Melbournians and tourists alike will want to visit and enjoy,” Williams said. The broad scope of the project – in both physical size and cultural value – is something the architects had to process and consider in their initial goal outlay. Cottee Parker’s preference of architectural form for the project is practical in the way it deals with the site but complex enough to integrate multiple uses. The firm’s aim was to provide an enviable destination precinct that offers retail, residential, hospitality and commercial activity without sacrificing their high benchmark for living. Shane Williams believes that opening all functions to a “green heart” was an essential goal for the design of West Side Place. “It was important for us to understand the site, its context and how best to integrate a large infill project. We wanted to enable sunshine and sunlight to penetrate into the heart of the project,” Williams said. The design of West Side Place has been a collaboration of consultants with Cottee Parker and Far East Consortium at the helm and landscape architects Rush/Wright Associates have been a valued contributor. To stand out in the booming urban landscape of Australia’s fastest growing city, the design elements of West Side Place had to be especially striking. Cottee Parker had the vision to provide a highly textured and detailed solution that would be multifaceted to allow a dynamic form and experiences both at the macro and micro levels. The final design draws inspiration from the site and makes references to some of Melbourne’s more cultural institutions such as the National Gallery of Victoria (NGV), with its massive scale and sheer bluestone wall. “We wanted to blur the line between tower and podium, so reminiscent of the modernist era, and instead integrate tower and podium, as best we could whilst complying with city planning conditions,” Williams said. The desire to preserve good sight lines and access to natural light were the major complexities of the design. Multi-faceted tower floor plates were generated to facilitate views out and allow access to sunlight and dense podium forms were “eroded” to enhance vision up into the development and down to the central landscape lanes and streets. West Side Place is a powerful addition to the Melbourne skyline and the city’s identity as the most “liveable” in Australia. The project features a range of luxury amenities including pools, gym and pilates facilities, indoor and outdoor cinemas, visitor chef kitchens, karaoke bars, private lounge areas, health spa and treatment rooms, private bar and dining rooms, private wine cellars, billiard rooms, library and study rooms. Its detail-oriented design and placement in the lucrative heart of the CBD will inevitably improve Melbourne’s tourism reach and provide residents with an exciting new living prospect. Construction has already commenced on West Side Place with the Stage 1 towers anticipated for completion in 2021.